It was a wet rainy morning and I woke up from my restless sleep. It was about 9:00 and I should have been up an hour ago. 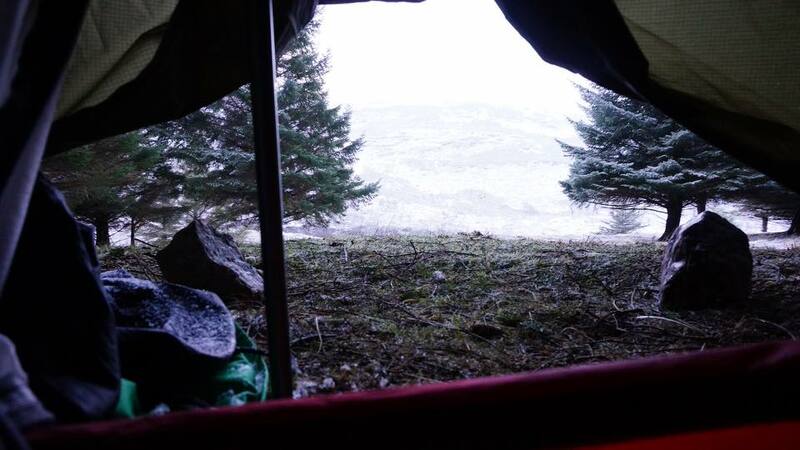 The condensation inside my bivvy had made my sleeping bag wet. I was cold and wet and didn’t want to go outside to get any colder and wetter. The bivvy is an incredibly claustrophobic thing: A waterproof tube that you slide inside with your sleeping bag and zip up over your head. It is the closest you’ll get to sleeping in a body bag – while you’re alive, anyway. I wished I had a tent. I just wished I had a tent instead of trying to go “ultralight” with a bivvy. I unzipped my damp sleeping bag, hauled a waterproof shell jacket over my head and reached for my trousers that were already wet from yesterday’s struggle. It took me nearly an hour to get up and ready. I ate a cold breakfast. The day would be a hard one: Ben More Lodge to Inchnadamph. A big ascent of 500 metres over pathless, boggy ground. The kind of day that makes you feel you are the tiniest of pebbles. trying to roll uphill. You long for good rest and comfort. The walk was pretty ordinary. Ben More summit is 998m and Conival is 987m. A ridge joins them both. This is one of the more popular Munro ridge walks in Scotland. Climbers do it quite a bit in Winter. Except I had only half of this to do, a contour around the apron of Conival which was 500m ascent. Fairly steep but not too much bother. I walked the 4×4 track until it turned to a scruffy footpath, then it turned into nothing. I walked the nothing for a bit more for a good view of the intended climb. I rested here and made a quick videoI nearly forgot my camera, which I had packed into a green Exped dry bag. Luckily I picked it up. Exped dry bags are so good that I imagined whoever would have found it in 30 years time would have found my camera inside bone dry, and they probably would have been able to turn on the camera and browse all my photographs. I thought fording the river and attacking from the South East would have been more gradual. But the guidebook route said the South was better. Even though it seemed steeper, I trusted the guidebook. I wasn’t too tired on this climb. It was quite a good view of the ben and the glen. I zigzagged up quite rough and hilly ground to reach the bealach (mountain pass). The final metres of ascent were more acute which told me it would probably smooth out flat on top. It did, and so I rested here on the flat “V-shaped” notch of the pass. I looked back at my progress and rested for a moment. Then I noticed something. It was a small green object, about 30 metres away from the path. At first I thought it was a rock with unusual moss on it, but something about it felt man made. I almost didn’t go examine it, it was quite far away, but for some reason I chose to go look. It was not a rock, but a bag. It was an Exped dry bag. It was not mine, it was the same type, but much bigger. I looked around for people and no one was there. It was a pretty large bag – no one could have dropped it by accident and not know about it. So I lifted the bag half expecting to find someone’s old wet clothes, or maybe rubbish in it. It weighed a lot – maybe 4 kilos. I opened the dry bag and there was a tent inside. I looked at the tent poles. One had snapped in two places. It would appear someone had broken and dumped it. I initially felt sad someone had dumped their rubbish here. So I considered taking it down off the hill to put in a bin. But it weighed a lot. That’s a lot of calories to burn for someone else’s responsibility. I decided to look a bit closer. I unrolled the tent and looked at the label – it was an MSR Elixir! This was not a cheap tent. MSR make some of the best mountaineering tents you can buy. The RRP of this tent is about £250. I unzipped the flysheet and inside were two half eaten packets of spaghetti carbonara. It was kinda gross. They’d left in a hurry. So I packed it up, packed the rubbish separately into my own rubbish bag and decided what to do. It weighed a tonne. Someone had obviously dumped it here, trashed it, and couldn’t be bothered with carrying a broken tent down the hill. There were no footprints of any sort. They must have been here when the hill was covered with snow, their tracks had melted away. The amount of water in the dry bag suggested it had been covered in frost and then defrosted inside. The pole was snapped in two places. The other was bent. It was like they had didn’t know who to put it together and had been forcing the poles to fit. I know from just a week ago that severe cold can snap tent poles like twigs – making them brittle. It had happening to me on my test camp in Snowdonia. There was one other possibility – that this tent belonged to a couple of mountaineers that had cached it here while they went to the top of Ben More for the day. 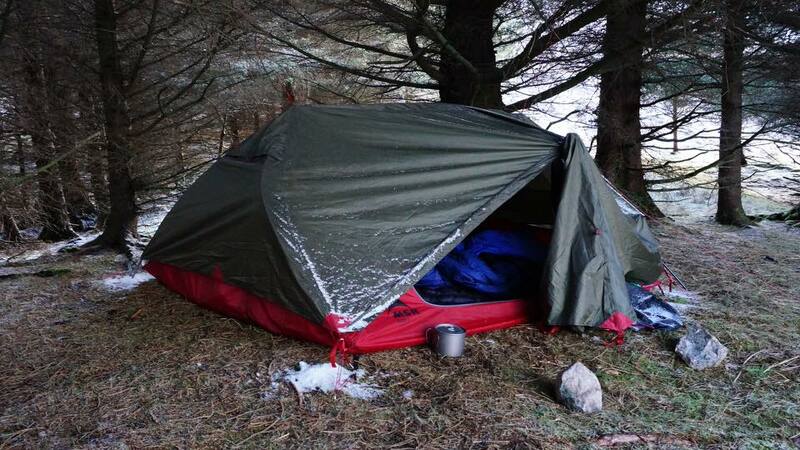 But it felt unlikely as the tent was wet – it had already been slept in. And eaten in. And it was broken. I must have pondered for 20 minutes wondering what to do. I decided that it was rubbish and I would dispose of it in Inchnadamph. take it off the hill and put it in a bin. I felt this was the right thing to do. It weighed so much more than I thought. Halfway down it struck me it was getting dark and that I would have to bivvy again. I didn’t really want to. The extra weight was crushing my knees. I walked over a landscape that seemed vast. Much larger and wilder than anywhere else I had been. I saw two large groups of deer, 50 strong, each convene together like antelope and run as an enormous pack. The river rambled down the face of the hill and many smaller hills dotted the landscape. I tumbled down the hill around them. I walked beneath a refreshing waterfall about 10metres high. I was a bit lost and decided to head North West where I could see the head of the sea loch, Inchnadamph. Eventually I found a trail alongside another river and forded it to follow that. About 20 mins of this and I got to a tree-lined hill near the Thrailach Caves that was a perfect spot for wild camping: A small hill with a loose cluster of trees with dry ground, and a bed of bouncy pine needles. “Five star”, I thought. Then I notionally wondered if I could use the tent somehow. Perhaps by splinting the poles I could make it work…. Most tents come with a short piece of tube just to do this. Until then I hadn’t thought about even putting it up, nor sleeping in it, just disposing of it. I don’t know why. I set to work. I pegged out the footprint, easy enough. I used the pegs from my bivvy and a few bits of greenwood as extra ground anchors sunk behind tree roots for strength. Then I put in one of the poles which was in good condition. I added the second pole which I splinted with my trekking pole. I wrapped some cordage around it to lash them together. It was makeshift but it kinda stayed up. The inner and the flysheet went on pretty well, but I tied these to nearby branches with a slippery half-hitch. Overall it worked and I now had a luxury tent to sleep in. Bloody hell. I went inside and actually whimpered with happiness, like the first caveman who discovered the luxuriousness of the his first ever cave-dwelling. It was a beauty of a geodesic tent – 3-man! A complicated design, but very spacious. I spread out my stuff inside. I cooked dinner in the vestibule and used the extra space to change my wet clothes. I had not had the luxury of doing this on my entire walk. I felt quite happy. But I worried that I had stranded a group of mountaineers up on Ben More without a tent. I hoped that I hadn’t. But I couldn’t be sure. I carried the enormous, luxury, 3-man tent for the remaining duration of the trip. It took my load weight to a whopping 22kg. But I had ultimate comfort, and truthfully, I didn’t regret it. Was I right to take the tent?